Ericsoft CRM allows to establish a long lasting relationship with the guest from the first touch point. 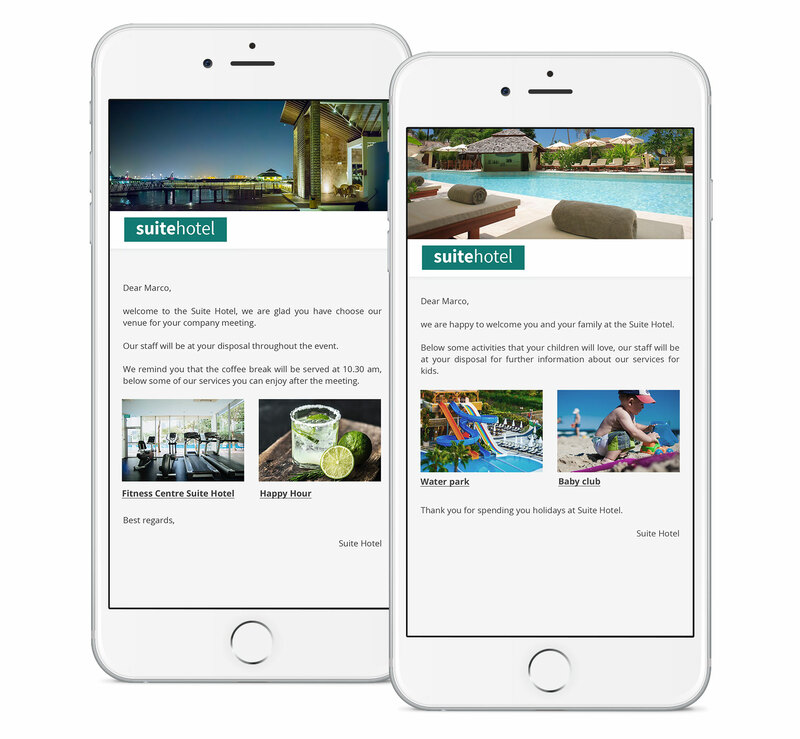 Thanks to email template and powerfull landing pages with an emotional impact, each communication between the hotel and the guest will enhance the quality of the guest experience and the hotel brand before, during and after the stay. Sending quotes will be quick and easy, in few seconds you can send an offer containing unlimited stay options. 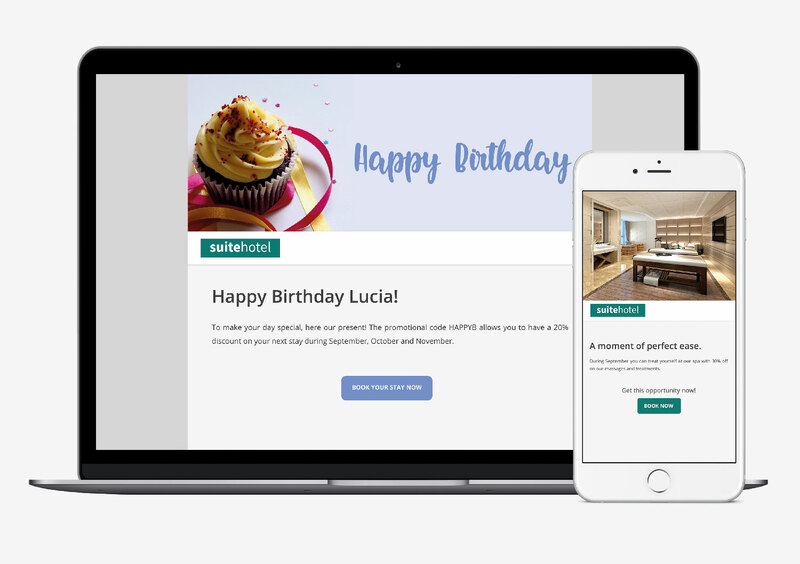 The future guest will receive an email (that will not be labelled “spam” as without commercial contents) with a short invite to click on a button to access to a mini website: a dynamic page with stay offers, rich in images and with an appealing layout. Within the mini website there is an integrated chat that enable the guest to interact directly with the hotel, each message received will be visible on the CRM back end as well in order to check the complete communication chronology. The drag&drop system for the mini website creation is very easy to use and allows to personalize the offer with images, videos, colours and texts. The rapid quote management and the dynamic offer presentation transform quote into confirmed reservations, increasing the conversion rate and the hotel’s direct reservation. Thanks to the CRM you are able to create prefilled template that will be sent automatically in the diverse moments of interaction with the guest: confirmation, pre-arrival, welcome and post stay. You can create different template based on guest type (family, couple, business traveller) and recall them through a tag system to reduce manual task. Customize communications and relevant communications send by the hotel are the basement for a pleasant guest experience. The CRM allows to implement marketing activities through communications containing offers and discount codes to previous guest and also to potential clients that shown interest for the hotel leaving their contact email. The aim of this communications is to nurture the relationship with existing clients, encouraging them to repeat their experience and to gain new clients. We have been creating complete and highly specialized technological solutions for the hospitality industry since 1995. Having an exclusive focus on a single industry, our investments have always been entirely dedicated to the development of our software and innovative applications for hotel and restaurant management. The experience gained over the years, together with what we acquire on a daily basis by being in contact with hospitality professionals, allows us to understand the real needs of the sector and to develop, based on new market trends and regulations, flexible and scalable solutions that can be customized according to the needs of each property, from independent ones to chains. Give us your contact details and our team will advise the most suitable solution according to your needs. How did you hear about Ericsoft? Name and contact data: Ericsoft collects your first and last name, email address, postal address, phone number and other similar contact information. Credentials: Ericsoft collects passwords, password hints and similar security data used for authentication and account access. Payment data: Ericsoft collects data necessary to process your payment, such as credit card number and the security code associated with the payment method. Customers and end users have choice options on the data collected and can therefore decline to provide such personal data; anyhow, if data necessary for service provision is not provided, some features or services may not be used. Ericsoft uses the data that collected for two reasons: (1) to provide the services offered, (2) to send communications, including informational and promotional ones. Customer support: Ericsoft uses data to diagnose service problems and provide support services. Service Improvement: Ericsoft uses data to continually improve the services offered, including the provision of new features or capabilities. Security, Safety and Dispute Resolution: Ericsoft uses data to protect the security and safety of its services and customers, to detect and prevent fraud, to confirm software licenses validity, to resolve disputes, and to enforce its contracts. Communications: Ericsoft uses data collected to deliver and personalize its communications with customers. For example, Ericsoft may contact customers by email or other means to: inform them when a subscription is about to end, communicate that updates are available, demand for information relative to a service or repair request, invite a customer to take part in a survey or remind them to keep their account active. Ericsoft shares customers’ and end users’ personal data with customers’ consent or based on the necessity to complete a transaction or provide a service requested or authorized by the customer or the end user. For example, when a customer or end user provides payment information to complete a purchase transaction, Ericsoft shares payment data with banks and other entities that process payment transactions or provide other financial services, for fraud prevention and credit risk reduction. Ericsoft shares personal data with its affiliates and subsidiaries companies, vendors and agents that work on her behalf, for the purposes specified in this policy. For example, companies hired to provide customer service support or assist in protecting and securing systems and services may need access to personal data in order to provide these services. In such cases, these companies must abide by Ericsoft’s data privacy and security requirements and are not allowed to use personal data they receive from Ericsoft for any other purpose. Ericsoft may also disclose personal data as part of a corporate transaction such as a merger or asset sale. protect the rights and property of Ericsoft, such as enforcing the application of the terms that govern the use of the services.